Mixed Media Magic - Take Two! Closing reception: August 25 from 2:00 - 4:00pm. 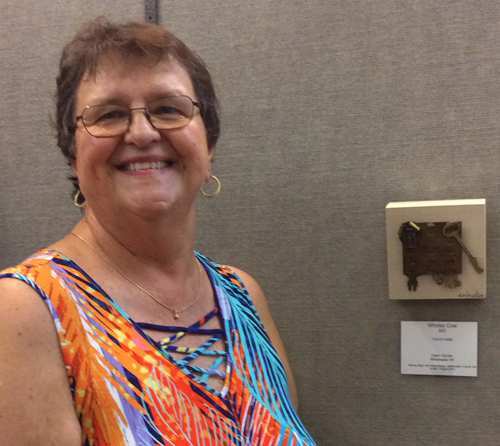 Thanks to artists and art lovers alike -who participated in last year’s “Making Magic with Mixed Media” show,there were 140 pieces of 2D and 3D art from over 45 local and area artists. Show organizers hope that this year’s offering will be greeted with an equally enthusiastic response from artists in the region, and from friends, families, and the general public who will want to attend and show their support. Mixed Media has become an umbrella term for 2D and 3D visual art that has been created and produced by artists from all over the country and the world. The magic is in the challenge of combining more than one medium (i.e., acrylic, oil, watercolor, pastel, charcoal, pen, pencil, etc.) and/or more than one material (i.e., cut up paper, wire, beads, found objects, etc.) in one piece of art. Some may debate that mixed media might also include using more than one technique in the creative process. Artists such as Edgar Degas, Marcel Duchamp and Pablo Picasso have influenced Mixed Media art over the years. As this art form grows in popularity, it also continues to evolve. Mixed media artists, professional and non-professional, will participate in this upcoming show. Artwork must be original, completed within the last two years, and not previously exhibited at the Cultural Arts Center. Artists who wish to exhibit their pieces should fill out the Mixed Media 2019 Entry Form below, complete it, sign it, and mail it with the $20 entry fee to the Whitewater Arts Alliance, P.O. Box 311, Whitewater, WI 53190. Monday, July 29, 2019. WAA members may submit four pieces; non-members three pieces. Prizes will be awarded as follows: 1st Place (2D & 3D) $100 each; 2nd Place (2D & 3D) $75 each; Viewer’s Choice $50; and Honorable Mentions (Certificates).